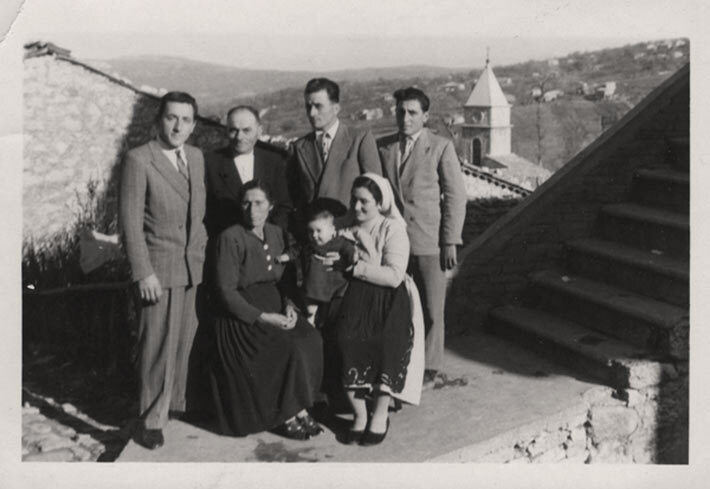 Black and white photograph of the De Francesco family posing outdoors at the foot of a landing in Guardiaregia, Molise, Italy. A church steeple and hilly landscape can be seen in the distance. Pompilio De Francesco, his wife Rosa and young daughter Carmela are seen here with Francesco's parents Giovanni and Filomenta and his brothers Salvatore and Vittorio. The photograph was taken shortly before Pompilio migrated to Canada with his family. The De Francesco family boarded the passenger ship Augustus on March 2, 1958 and arrived in Halifax, Nova Scotia on March 10, 1958. The family was sponsored by Rosa's father Domenico Nicolangelo Rotundo. The family shared a little room on the ship complete with bunk beds and a small sink. Rosa and her daughter Carmela were able to watch their first film, Gone with the Wind, while on the ship. After arriving in Halifax, the family boarded a train for Toronto. According to the archives at Pier 21 in Halifax, Nova Scotia the Augustus stopped at the following ports: New York, Boston, Halifax-Lisbon, Casablanca, Gibraltar, Barcelona, Cannes, Genoa, Palermo, Naples, Partras, Venice and Trieste. When the De Francesco family arrived on March 10, 1958 there were 563 passengers on board.